A little advice, anytime you can wrap anything in bacon, do it. What I love about this recipe (besides that it is a vegetable WRAPPED IN BACON) is the fact that it can still be considered healthy because it's only half of a piece of bacon. I actually got this recipe from one of my favorite food blogs, SkinnyTaste. Everyone can eat one piece of bacon…even if you're watching your shape. If you wanted to be even better, just use turkey bacon. 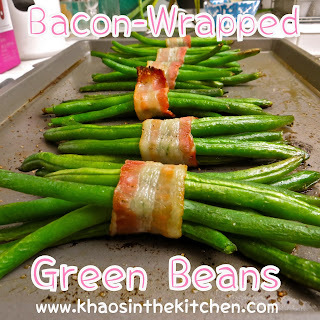 I love fresh green beans & this was a nice way to spice up a typical side dish. Not to mention, these little bundles were super easy to make. J might have eaten 2 or 3 bundles. Whoops. How difficult was this for Rachel? Not bad at ALL! Bring a large pot of water to boil. Drop beans in & let cook for 1 minute. While beans cook, fill large bowl with ice water. Divide the beans into 6 even bundles. Wrap with bacon & place seam side down evenly on a greased baking sheet. Bake for about 14-16 minutes until bacon is cooked.